A Noble prize-winning scientist has been stripped of his honorary titles at a lab after doubling down on his 'reprehensible' views on intelligence and race. 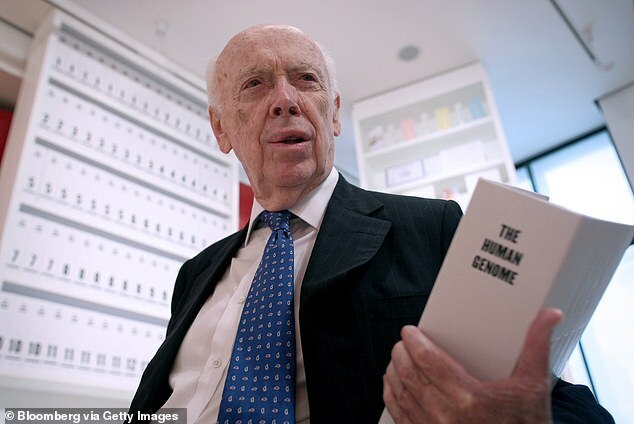 James Watson, 90, who shared a 1962 Nobel Prize for discovering that DNA was a double helix, lost his job in 2007 for expressing racist views. On Friday January 11 he was stripped of several honorary titles by Cold Spring Harbor Laboratory, in New York, which he once headed. The lab said it was reacting to Mr Watson's remarks in a television documentary aired earlier this month. In the 2007 interview, Watson said that while he hopes everyone is equal, 'people who have to deal with black employees find this is not true.' In this month's documentary, he said genes cause a difference on average between black people and white people on IQ tests.